An ATA is a simple device which lets you connect any standard telephone or fax machine so it can use VoIP through your internet connection. The ATA converts the analog signal from your telephone into digital data that can be transmitted over the internet. Providers usually bundle this device with their service so that you can start making calls right away. IP Phones are special telephones which look and work like normal phones but connect directly to your internet connection without the use of ATA device (to convert analog signals to digital signals). 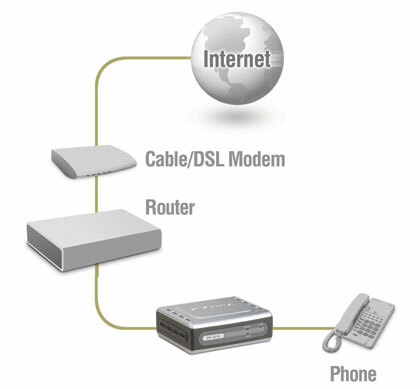 An IP Phone plugs directly into your internet router and comes in both wireless and corded models. Business VoIP users generally opt for IP Phones because they have special buttons which allow calls to be transferred put on hold and have multiple lines. Using software installed on your computer and a headset you can make and receive VoIP telephone calls right on your desktop or laptop. You can even place callers on hold, transfer them to another extension, or answer multiple telephone lines. Some software also allows you to host conference calls.